There is a lot of discussion these days in the children's book world about books providing mirrors and windows, ways for readers to recognize themselves and see other cultures. 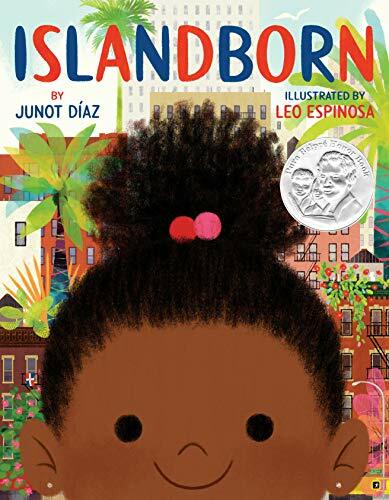 Islandborn, a brightly-colored picture book by Junot Diaz, illustrated by Leo Espinosa, shows us these windows both figuratively and literally. The main character, Lola, goes to a school where every kid was from someplace else, a “school of faraway places.” When her teacher assigns the class to draw a picture of their first country, each student is excited to share their stories. Everyone except Lola, who left “the Island,” as her nameless country is called, when she was a baby, too little to remember anything. The book follows Lola as she asks her friends, neighbors, and family about their memories of the Island. It is in this central part that the art really shines, giving a glorious sense of how the Island looks, tastes, and smells. And also of Lola's feelings as she discovers a place she wishes she could remember but can't. There's another complication besides Lola figuring out her relationship to the Island, how she can be from a place she can't personally remember. As Lola hears how wonderful the Island was in the memories people share with her, she wonders why they all left. The answer to that lifts this to another level of storytelling, with the kind of complicated issues not usually associated with picture books. The memories of the hurricane and the Monster allow young readers to ask about reasons for immigration and to understand better the different forces driving people from their beloved homes. When the students hand in the assigned drawings, the teacher puts them all up, saying, “Now our classrrom has windows. . . Anytime you want to look at one another's first homes all you have to do is look out the windows.” This part could be the tagline for the Windows & Doors movement and will surely inspire teachers across the country to follow a similar lesson plan. A final word about this rich collaboration. Leo Espinosa is an experienced book illustrator, but this is Diaz' first picture book. He is well-known for his adult novels, such as The Brief Wondrous Life of Oscar Wao (which won the Pulitzer Prize and National Book Critics Circle Award). Remainder shelves are filled with picture books written by adult authors trying to make the transition into the children's book world. How hard can it be, after all, with so many fewer pages? Diaz has avoided the worst pitfalls of his peers. He isn't heavy handed or message-driven. He doesn't write down to his readers. Rather, his writing is clean and active, rich with imagery. Most important of all, he allows the illustrator space to work his magic.